About 40 hours ago JetBlue announced their All You Can Jet pass (better known to experienced jetters as #aycj). A few minutes ago they announced that the 7 day pass had sold out. JetBlue introduced the pass last year and I jumped at the offer. I knew that I wasn't going to take time off work, but four weekends was still tempting, so I got mine as did many others. At the end of the 30 days though, a new community was built. A community that communicated over twitter using the #aycj tag as a chat room, that met at airport terminals, most notably T5 at JFK, and a bunch of strangers that identified each other by the little blue button with a twitter tag. A few of them turned into celebrities in their own right. The hype really built up even after all passes were sold out. There was enough press and blog action that even if JetBlue didn't make a profit off of it, they definitely won many new loyal customers. So why would an airline do this? The timing of the pass seems to answer that question. Traditionally, the period between Labour day (the first Monday in September) and Thanksgiving is when Americans fly the least. Except for really busy routes, most flights will go empty. This is a great time for airlines to throw out special offers, and it essentially turns into a pricing war between who can offer the cheapest seats. JetBlue wins this round because they did something completely different. They didn't offer cheaper seats, they offered one very expensive seat that you can take with you for 30 days. The restrictions on booking ensure it isn't abused, and the result is fuller flights, and possibly more people paying $6 to watch movies on board. I bought my pass this year a few minutes after I saw the first tweet about it, even before the email from JetBlue hit my inbox. Now, a little under two days later, the passes are sold out. It took a lot longer last year, and it will probably be a lot shorter next year. Here's looking forward to another 4 weekends of travel. There were but two ways to do it. We could go on for almost two hours, rocking from side to side, getting splashed with sea-spray, all for a little more than the price of dirt, or we could do it in under 10 minutes skimming over the surface and doing one quick turn for 20 bucks. We chose the latter, mainly because it meant we'd get an extra two hours of sleep before checking out of the hotel. It was day two in Puerto Rico, and we'd gone to bed exhausted after a very long and awesome day spent on the beach followed by hiking the rain forest of El Yunque. Waking up early to catch a ferry for a 90 minute ride to Vieques wasn't exactly an appealing thought, but what choice did we have? They called him Brooklyn — because that's where he hailed from. A New Yorker all through, he worked as a bell boy at the Wyndham because Puerto Rico was an awesome place to be. I told him our problem, and he says, "Hey bro, I have a better idea...". He whisks out a map and starts drawing, "you head down to Ceiba. There's a tiny little airport there, and you can get a flight to Vieques for $17. That's what I'd do. And they fly out every hour or so while there's only one ferry that'll get you there in time". So we set out after a decent breakfast for the drive to Ceiba. It wasn't hard getting there, but we got lost nonetheless. Blame it on my inability to read signs in Spanish as they whizz past at 50mph. All the same, we made it in good time, and parked at the little parking lot. Walked in to the airport and were struck by how small it was. There were three airline counters, they looked very similar to what you'd see at any commercial airport. Brooklyn suggested we fly Air Flamenco, so that's what we did. There was also Vieques Air Link (VAL for short) and another smaller airline. As we got there, a flight was just leaving, and they told us that we'd be on the next one which was in an hour. We were scheduled to get onto a Kayak and Snorkeling tour at 2, and it was 11:30. We figured we had enough time. That's when the thunderstorm hit. It poured like you'd expect in the tropics. Nothing to be afraid of, except not the kind of weather that a little 8 seater aircraft wants to fly in. We were stuck in Ceiba with no idea of when we'd get to Vieques. It was now 1:15, and we were really upset. It takes just about 8 minutes to fly from Ceiba to Vieques, and 10-15 minutes for a cab to get us from the airport to where we had to meet the tour. The guys at Ceiba signalled the pilot at Vieques telling him to be ready to leave as soon as he landed, and they called for a cab to meet us at the airport in Vieques. We walked down to the plane — no TSA in sight, which was refreshing — and sat down. 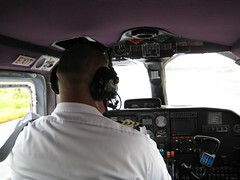 We were the only two passengers and sat right behind the pilot. We had an amazing view of the plane and the reef below. 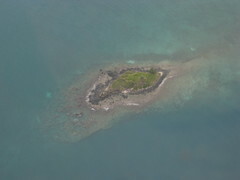 We flew so low that you could see right through the water to the coral below. The airplane had no air conditioning, instead there was a little opening in each of the windows to let the wind in. We touched down at Vieques at 1:45, grabbed our bags from the plane's hold and ran outside. Our cab was waiting for us, and got us to the shack that we were staying at. We checked in as quickly as we could and then ran to join the tour. We were a few minutes late, but they were still there going over safety requirements. In the rush, we'd left our towels and change of clothes back at the shack, so what we were wearing was all that we had, but we made it for the kayak and snorkel trip, and that was totally worth it. More about that next time.